The past week has brought gorgeous sunny weather — even surprisingly high temperatures — to the Puget Sound area. That’s been great for our vitamin D-deprived bodies, but our plants may be feeling the heat. This week has been the perfect time to tap into your 50-gallon rain barrel (hopefully you have at least one installed at your house) to use up the water that you’ve stored from the spring. (For where to buy in Seattle, go to the Seattle Public Utilities Web site; for King County information, check out this site). 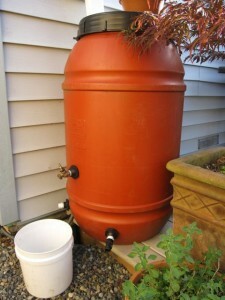 Rain barrels allow you to catch rainwater off your roof during rainy days, and to store it to use during dry periods. Seattle relies on mountain snowmelt for its water supply, so water is precious during summer months (especially if we’ve had less snow than usual the previous winter). Water rates also jump in the summer months, so rain barrels can help you save money and conserve water. We have two rain barrels that we bought from the city of Seattle and have set up in the backyard to water our non-edible plants. Should you use the rainwater from your roof on plants that you eat? We err on the safe side and use the water exclusively for our non-edible plants. We have plenty of other trees and shrubs to water, and our vegetables are already on an efficient drip-irrigation system. Over the years, I’ve found that the easiest way to water plants, especially trees, is to buy a few cheap 5-gallon buckets, poke a hole near the bottom of each bucket and set them under the rain barrel to fill one at a time. Once a bucket is full of water, I’ll set the bucket out near the base of a tree that needs water while another bucket is being filled under the rain barrel. Trees, shrubs and other plants like the slow, deep irrigation that trickels out from the small hole in the bucket. The slow-drip allows the water to seep into the soil more deeply rather than just running off the ground surface or evaporating. I made a rain bucket out of a $10.00 Trashcan. So far so good. I have step by step pictures if interested. Gravity Gardener, my first rain barrel was just like that. Great, simple idea!